The Purge is coming. Will you hide? Or will you seek? Prepare for The Purge with The Purge: AR app and defend your home against ruthless Purge Night attacks. 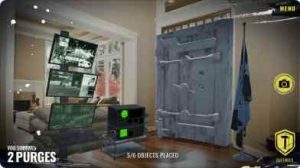 Unlock up to 30 objects— including panic rooms, barbed wire and bear traps— customize them to fit your walls and ceiling and use them to fortify your home. Then, put your defenses to the test and see if you have what it takes to survive Purge Night. As you clear increasingly difficult stages, you will get rewarded with additional objects to safeguard your home. Don’t forget to snap pics of your defenses and share them with friends! For the best experience, The Purge: AR requires an ARKit supported device. THE PURGE Premieres September 4 at 10/9c on USA Network with the premiere and finale episodes simulcast on SYFY. Compatible with iPhone 6s, iPhone 6s Plus, iPhone SE, iPhone 7, iPhone 7 Plus, iPhone 8, iPhone 8 Plus, iPhone X, iPhone XS, iPhone XS Max, iPhone XR, 12.9-inch iPad Pro, 12.9-inch iPad Pro Wi-Fi + Cellular, 9.7-inch iPad Pro, 9.7-inch iPad Pro Wi-Fi + Cellular, iPad (5th generation), iPad Wi-Fi + Cellular (5th generation), 12.9-inch iPad Pro (2nd generation), 12.9-inch iPad Pro Wi‑Fi + Cellular (2nd generation), 10.5-inch iPad Pro, 10.5-inch iPad Pro Wi‑Fi + Cellular, iPad (6th generation), iPad Wi-Fi + Cellular (6th generation), iPad Pro (11-inch), iPad Pro (11-inch), iPad Pro (12.9-inch) (3rd generation), and iPad Pro (12.9-inch) (3rd generation). Requires iOS 11.3 or later.